Size of this preview: 792 × 599 pixels. Other resolutions: 317 × 240 pixels | 826 × 625 pixels. Description: Drawing of Michael Faraday's 1831 experiment showing electromagnetic induction between coils of wire, using 19th century apparatus, from an 1892 textbook on electricity. 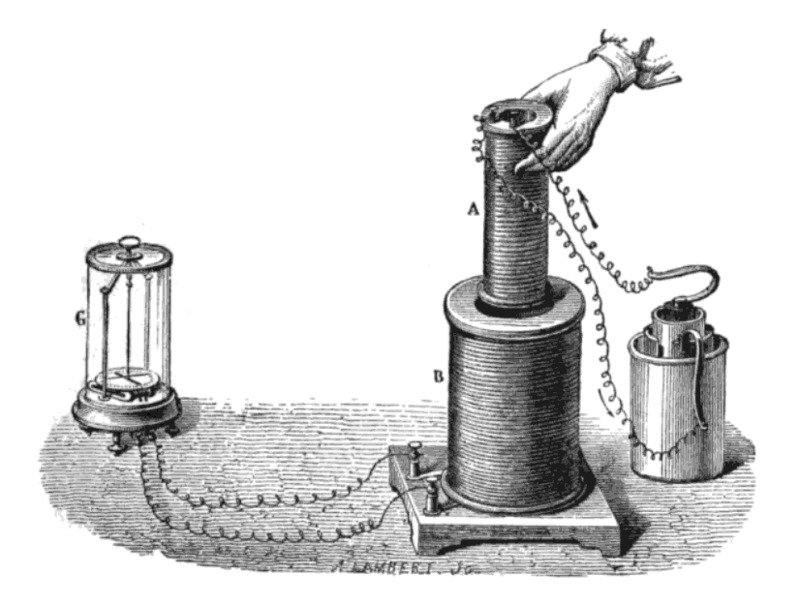 On the right is a liquid battery that provides a current that flows through the small coil of wire (A) creating a magnetic field. When the small coil is stationary, no current is induced. However, when the small coil is moved in or out of the large coil (B), the change in magnetic flux induces a current in the large coil. This is detected by the deflection of the needle in the galvanometer instrument (G) on the left. Credit: Downloaded 2009-08-06 from Arthur William Poyser (1892) Magnetism and electricity: A manual for students in advanced classes, Longmans, Green, & Co., New York, p.285, fig.248 on Google Books. The drawing is signed Lambert, J. This page was last modified on 20 April 2017, at 23:25.